TopWeb: The web agency that cares, big words but we mean them! We can help you with everything in print and web. What you need to do is click on the link below, fill in the form and then we will return with a free sketch. How smoothly does it not sound? We at TopWeb tailor-make solutions for your needs. We are working for the motto everything can be solved, and so far no problems have been too big for us. TopWeb is the web agency at its best. Big words that are easy to throw away, but we mean them. We never leave anything half-finished and we really care. We work on until you are completely satisfied. We plan the graphical based on your requirements and wishes. We discuss content as well as design and together draw up sketches on how the finished product may look. We take the sketches and transform them into code that works on the Internet. The templates built from the sketches are inserted into wordpress and the whole page, including texts and images, takes shape. We produce your digital material with full focus and of course drink several cups of coffee. Without the black and lovely drink, this stage had been snowy. We keep an open dialogue so that you are involved throughout the process, and we will gladly come over one some coffee. It is now that you have access to a first draft of your new web page or the graphic work done. If you are not satisfied with what we have produced, we can conclude the cooperation here and you will pay nothing. We test so everything is working properly. We install statistics tools and review our checklist so that nothing has been missed. You are always welcome to contact us after completion of the project. 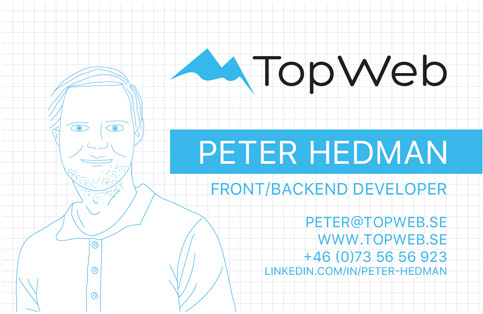 TopWeb web agency is created by Peter Hedman who has a MSc in Industrial Economics with a focus on IT at Blekinge University of Technology. Peter is today 29 and the first time he encountered code he was 15 years old. Peter loves to put his teeth in hard problems. Some of the best he knows is the feeling after having spent a long time with a problem and finding the solution. Peter has acquired theoretical and practical knowledge of Lean and Agile’s product development and working methods like scrum. The importance of system vision is repeated continuously and also how something that initially was not intended to affect ultimately can still produce unexpected consequences. Peter is good at seeing the whole, not just theoretically, but also in practice. He thinks programming is fun, which shows in the results of completed projects. We build all our websites in responsive design, so they always look good even in your mobile device. We update all our websites and wordpress plugins continuously as new updates come, so you’re always on the latest, and safest application. Security is important to us and something we spend extra time on. We only use sources that do not have illegal licenses, so everything we build is completely legal and can be authenticly exposed to the outside world. If we use third party programs, they are always included below GNU General Public License, which means it is legal to use and modify, to best suit your needs. All strings in our developments, website as wordpressplugin, are of course prepared for translation, meaning you can easily change all texts. 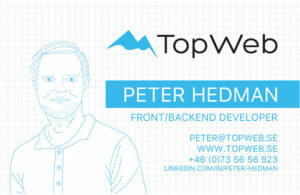 Please contact Peter on the link below for an unprecedented discussion of how TopWeb can enhance your graphic appearance. You can also contact TopWeb by submitting an inquiry.